Hazards geography is a rapidly growing field and is the second major component of my current research. Geography and climatology play a key role in dictating when and where natural and sometimes even anthropogenic hazards occur. Every corner of the world is vulnerable to at least some hazards and it is important to understand the geography of these hazards so that we can better prepare for them and mitigate their impacts. The map on the left (click to enlarge) shows all of the hurricanes that have impacted South Carolina over the past several decades. This was part of a recent project that reanalyzed the hazard mitigation procedures before, during, and after Hurricane Hugo. SLOSH models were also utilized during the reanalysis to understand the actual impacts vs. the potential impacts if the storm had taken a different track and if future potential sea level rise is taken into account. Economic loss models are often used for hazard mitigation and planning because specific populations, buildings, and other forms of infrastructure can be included in the models to varying levels of detail. In the hazard mitigation and planning process, a community (or in my case multiple college campuses) is profiled to assess the potential vulnerabilities to all hazards, the current infrastructure in place to mitigate or respond to these hazards, and the need for specific mitigation actions and strategies. Collectively, HAZUS-MH, GIS-derived maps and databases, and community involvement help to achieve the goals of producing a more resilient community that is better prepared for future hazards. 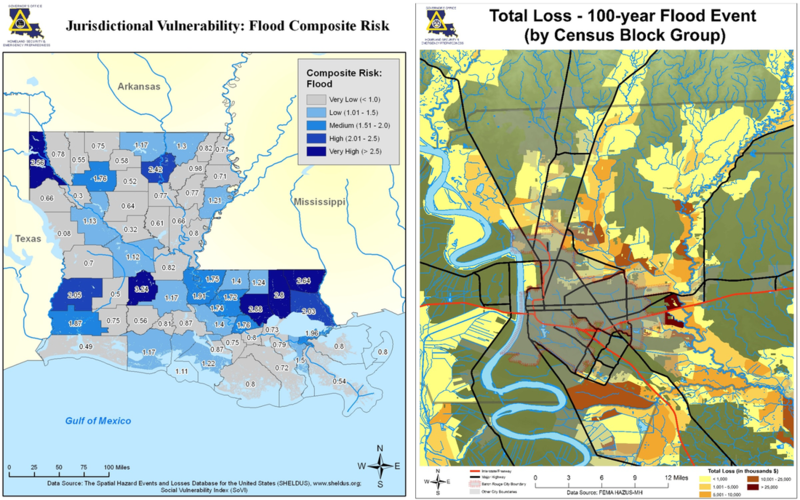 As part of my research assistantship at LSU, I was a primary author for the Disaster Resistant University (DRU) hazard mitigation plan (HMP) that included four LSU campuses in Baton Rouge and three separate LSU system campuses in Eunice, Alexandria, and Shreveport. The plan was submitted at the end of 2012 and officially approved by FEMA in March 2014. My contribution focused on GIS database management and development, economic loss modeling, hazard profiling and description text, and climate-related text. I was also the assistant project manager for the state of Louisiana hazard mitigation plan 2014 update, which was approved by FEMA in April 2014. You can view the plan here. Additionally, I developed the Geoinformatics and Disaster Science (GADS) Lab at ETSU where I am now the Director. The GADS Lab provides hazard mitigation planning services to institutes of higher education across the United States, and local hazard mitigation planning services for counties and other jurisdictions in Tennessee. Plan and product development are data-driven and GIS-based, resulting in comprehensive risk and vulnerability assessments that align with policy goals. With an intensive focus on GIS, products are also geared towards visually communicating hazards and risks to large and diverse audiences through cartographic skill and intuitive webmap/app design. The GADS Lab recently completed HMPs for Tufts University and ETSU, along with Threat and Hazard Identification Risk Assessments (THIRAs). The Tufts University HMP meets Emergency Management Accreditation Program (EMAP) standards and was approved by FEMA (Region I) in July, 2018. The ETSU HMP is currently under review with FEMA (Region IV). Economic loss modeling plays a crucial role in identifying areas that may be vulnerable to certain hazards and estimating the potential cost of these hazards. The most popular economic loss models are FEMA's HAZUS-MH (Hazards US-Multi-Hazards) and the US Army Corps HEC-FDA (Hydrological Engineering Center - Flood Damage Reduction Analysis) models. I have used the HAZUS-wind (hurricane) and HAZUS-flood models for several projects in Louisiana and the HAZUS-earthquake model for projects in Charleston, South Carolina and Boston, Massachusetts. I was also formally trained at the FEMA Emergency Management Institute in Maryland. 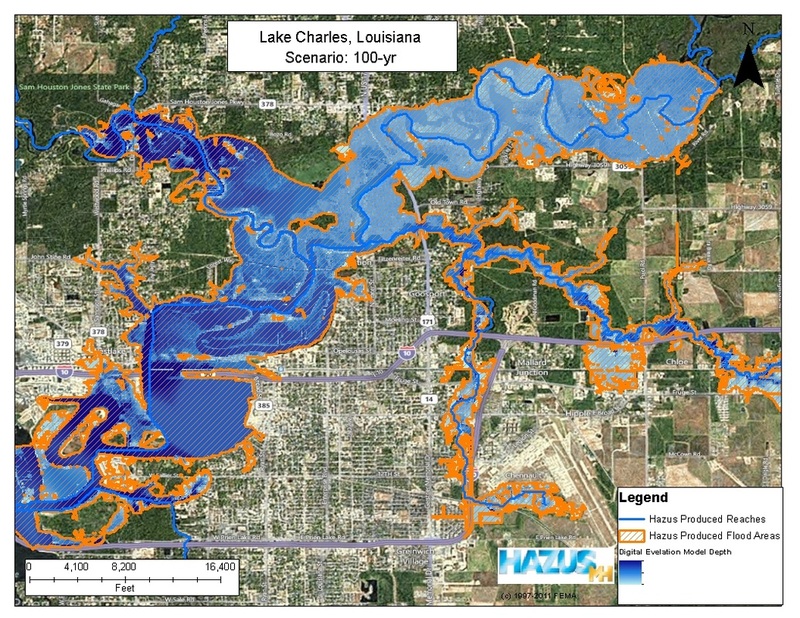 The map on the right (click to enlarge) shows a 100-year flood scenario in Lake Charles, Louisiana. A completed flood model shows the inundation depth, general and specific building losses ($), debris tonnage, agricultural losses, essential facility impacts (e.g., hospitals, police stations, etc. ), expected casualties, loss of use (# of days/hours), and economic impact (length of recovery - loss of work). A newer feature in HAZUS-MH allows for a combined wind and flood model that aggregates hurricane wind and storm surge losses together and this has been implemented for some of my recent work in Louisiana. _When referencing text or graphics from this website, please use the following citation: Timothy Andrew Joyner. 2018. www.tandrewjoyner.com. Last accessed ?/?/20? ?.